As I was doing a mental countdown of the days until I left to go visit my dad recently, a wave of low-level anxiety accompanied my preparations. I HATE being away from my husband for even a single night. I have trouble falling asleep without him in the house, and whenever I pack up the baby and hop in the Dodge to drive to California without him, I don’t want to pull out of the driveway. But I do, because I am always really excited to see my dad, my almost-stepmom Susan, my BBF (beautiful best friend) Casey, her babies, the Dowlings, the Fitzgeralds, the McVaes, and all the other folks from my hometown who have known me since my days of running around the grocery store singing “One-eyed, one-horned, flying Purple People Eater” while my mom picked out fresh fruit. When visiting Dad, it’s impossible to escape childhood memories, since he lives in the house my parents bought just before their divorce. We moved in on Saturday, March 2, 1996 (why can I remember that date, but not the magazine’s deadline each month? ), and then Dad and I lived there during my high school years. He and Susan have since redone the flooring, painted inside and out and rearranged the landscaping, but they can’t modernize the whole neighborhood. I turn onto the dirt road of Quartz Avenue and think That’s where I used to lope circles in the sagebrush…that house didn’t used to be there…the guy who lives in that house used to yell at us for riding our horses on his property…the meth house is gone? Hey, the neighborhood is improving! I’ve known my BBF Casey since I was four years old, and she stuck around the old stomping grounds after marriage and babies. She brought her babies over, and we watched our toddlers play in the yard where we used to run through the sprinkler and take pictures of ourselves trying to do handstands. I stay in the guest room these days, though, not behind the first door on the left with the twin bed and horse collage on the closet door. Casey and I both went to high school in Yreka, population 7,500 and the county seat. Dad lives in a rural subdivision, Big Springs, about 20 miles from Yreka. Growing up, it was “We’re a ways out there, it’s twenty miles to town.” On this last visit, I was struck by how close together all the towns were and how much traffic there was – I couldn’t just pull over the pickup wherever I wanted and pee for fear a car would come by within the next two minutes. A little different than the high desert country I’ve gotten used to, where traffic flows at a rate of one vehicle per hour, more if the neighbors are shipping cattle. And there were grocery stores like every twenty miles! People did bizarre things like pick up chicken and broccoli on the way home from work. Nobody had a walk-in refrigerator, two chest freezers and flour in five-gallon buckets. Whenever I opened the fridge door at Dad’s and saw just one half-drank gallon of milk, my first thought was, “Shoot, I hope there’s more in the freezer.” But nope, there wasn’t – someone just stopped off at the store on the way home from town and picked up a fresh gallon. I had to do it once, just because I could. Besides marveling in wonders like the quick grocery store run and public restrooms, I got to catch up with lots of old friends. I probably talked about Jim too much, though. Everything reminded me of him, or of something he once said, or did, or might say or do. I had to refrain from saying “Jim said….” or “Jim always….” too much. Besides talking about him, I was also strongly compelled to talk to him. Jim and I maintained an average of about five calls per day. After a two-minute conversation one afternoon, my dad asked me if everything was okay. In college, I loved driving north from Chico and seeing the “Siskiyou County” road sign. 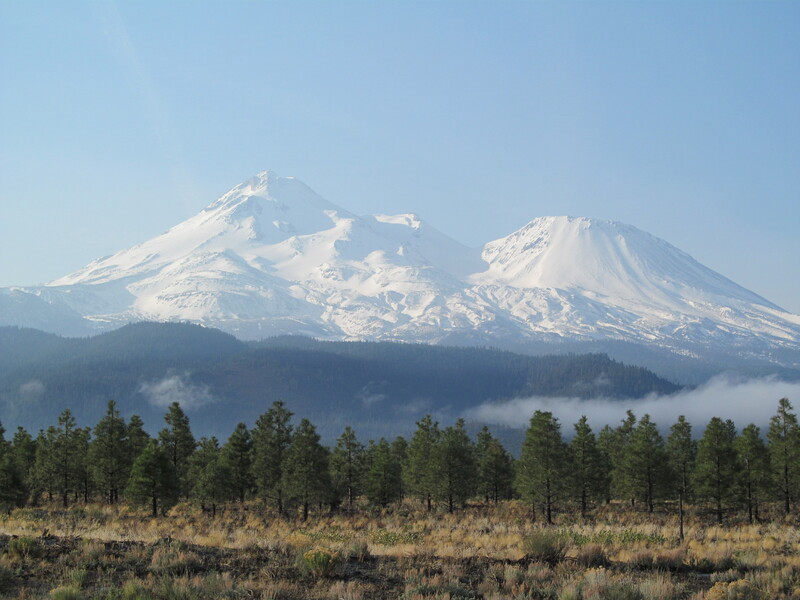 When Mount Shasta came into view, I knew I was almost home. Now, I love stretching my eyes to the horizon and seeing nothing but sagebrush, alkali flats, mountains and that one really cool old wooden windmill on the north side of Highway 140 between Adel and Denio. The house doesn’t matter so much, because we are a young buckaroo family; we’re approaching our second wedding anniversary this summer and I’m unpacking boxes in our third house this weekend. What does matter is who I’m coming home to. 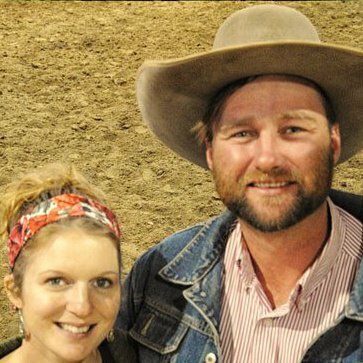 I absolutely freaking love the sight of a 6’3″ tall cowboy with a dirty silverbelly hat, dark blue Levi’s, lettuce picker boots, a denim jacket, a five-day beard and smiling blue eyes standing in the driveway to greet me and Grace when we return home. I kiss him like he just got home from the war and everything is right in my world again. This used to be the sight that meant I was almost home. Now, he’s the one thing I can’t live without. Above photo by Mary Williams Hyde. Cowboy's Sweetheart, Hey I left the ranch!